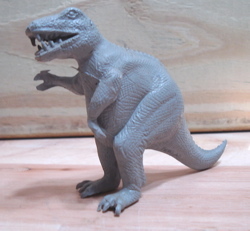 The Marx Large Mold Group PL-749 Dinosaur Toys: They ushered in a new era of prehistoric play. were the first trickle in what has become a flood of imagination and fun. These figures are described in detail elsewhere on this site. Produced in the new magic material, plastic, these Dinosaurs found themselves in toy boxes, sandboxes and featured in out-of-the-box play for the next decade and more. Today they find themselves high on the list of vintage collectible toys that Dinosaur collectors covet. Produced heavily from 1955 until 1959 it was found that the Pot Belly T-Rex was simply not conducive to mass production and had to be replaced in the Marx Toys Dinosaur universe. 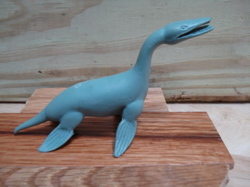 Therefore the Kronosaurus and the Brontosaurus from this set also found themselves in short supply as this Mold Group had its production severely cut back in favor of new figures. 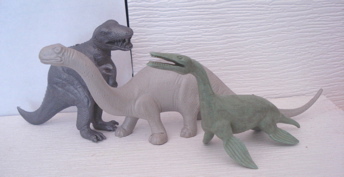 Collectors find these three to be among the most desirable of the Marx Dinosaur toys. These are the Rarest of All the Marx Dinosaur Toys and highly prized by collectors. In our continuing efforts to upgrade our site for YOU our visitors we have added a Dino-Blog that you can painlessly subscribe to for FREE! We have also added a Contact-osaur-Us form (see below) so YOU can tell us what you need and want from this site.